BANGI, 1 August 2014 – Expectant mothers in Malaysia seem to know less about the need for their medical check-ups and for their unborn babies than they do about abortion. 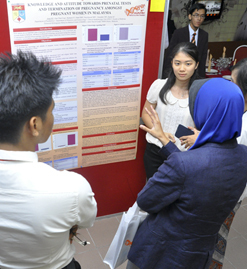 A team of final-year medical students of The National University of Malaysia (UKM) found more than 91% of pregnant women who responded to the survey had poor knowledge about pregnancy care but 67% had satisfactory level of knowledge about termination of pregnancy (TOP). A member of the team Gan Chen Ling told UKM News Portal in Kuala Lumpur recently that the respondents, however, showed a more favourable attitude towards prenatal tests. Gan said although they knew more about abortions, they did not subscribe to it due to moral, social and their religious upbringing. A total of 169 women took part in the survey carried out earlier this year at the UKM Medical Centre to find out factors influencing their views towards prenatal care and abortion. Advances in ultrasound technology and pregnancy care have allowed women to have better informed choices which had increased concern that pregnant women may choose abortion over delivering. However the results did not indicate such an attitude, Gan said. The survey found that the majority (93.5%) were well-disposed towards prenatal tests and less favourable towards pregnancy termination. They were asked whether they would consider abortion if their fetus have common congenital diseases such as Anencephaly, Thalassaemia major and Cystic Fibrosis. Their attitude towards TOP was assessed based on descriptive examples of 19 clinical conditions. The cross-sectional study was done at the Fetomaternal clinic with the aid of specialists from the Department of Paediatrics, the Department of Obstetrics and Gynaecology and the Clinical Epidemiology Unit. Thalassaemia is a common public health problem in Malaysia and about 4.5% to 6% of the Malays and Chinese are carriers of this genetic disorder. The major forms of thalassaemia result in death during pregnancy of affected foetuses (thalassaemia major) or life-long blood transfusions for survival in β-thalassaemia. There was an earlier study in the country to determine differences in public awareness, perceptions and attitudes toward thalassaemia among the different races. The analysis indicated that premarital screening programmes for thalassaemia may be more effective and culturally acceptable in the reduction of pregnancies with thalassaemia major. The findings showed that information campaigns about thalassaemia may convince Malaysia’s diverse socio-demographic and ethnic communities to cultivate positive attitudes toward prevention of the condition.